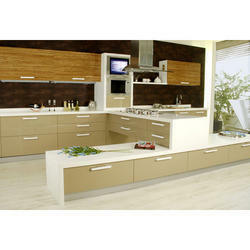 Leading Manufacturer of island straight designer kitchen and gloss island kitchen from Noida. We are a credible name that is engaged in the manufacturing and exporting of a premium quality Island Straight Designer Kitchen. Our team of quality controllers checks the whole range of the kitchens offered on various parameters and hence assures the kitchens of an invincible quality for our customers. Moreover, this offered kitchen is eco-friendly and water proof in its characteristics. 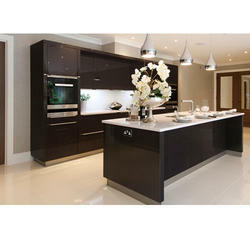 We are the leading manufacturer, wholesaler, trader and supplier of an optimum quality array of Gloss Island Kitchen. Comes in numerous designs & trendy look, we manufacture this kitchen by using optimum quality wood with other related material as per the quality norms. Offered kitchen examines on various quality parameters so as to assure its flawlessness. Looking for Poly Gloss Kitchen ?